Charlotte, North Carolina emcee Shane Coble a.k.a. Stranger Day presents You’re Welcome, his new album featuring production from Ryan Hemsworth, Ducko McFli [who you might recognize from ATL Pass The Mic], Black Siren, Wilguts, Heroes&Villains, BanksOnTheBeat, UZ, Dnae Beats, The Amps, Clicks&Whistles, Guttercats and Alist. Shane followed up his first project Young, Dumb & Dope with the Barstool Bounce EP which included production from Mad Decent’s DJA, and included Not Playin which was featured on MTVU, Fuse and AOL Music. Bounce also included production from Philadelphia’s EMYND who Day teamed up with for the rock ‘n roll sample-fest A Sunday Drive With The Windows Down. Day dropped his first full-length album Vice Matters in 2012. Stranger recently dropped the video for first single Shut Up. “The idea behind the mixtape as to make something that is interesting from start to finish that will keep the listener guessing what’s next… in true mixtape fashion,” says Stranger. 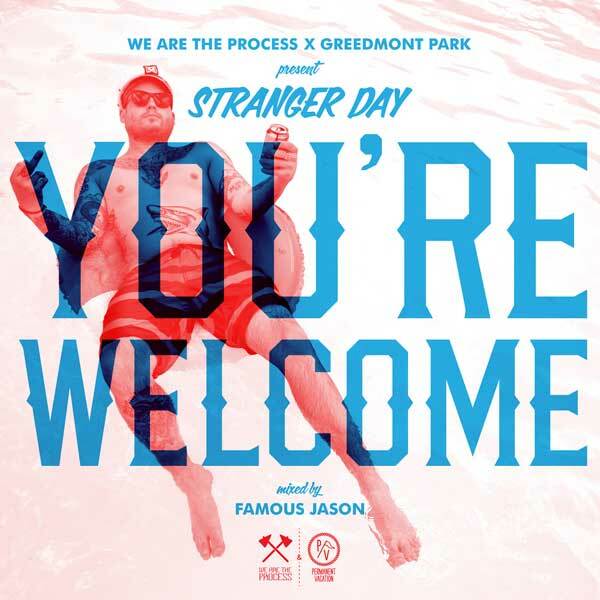 “You’re Welcome showcases what I can do as a rapper and what my DJ can do as a DJ.” You’re Welcome is mixed by Famous Jason and presented by Atlanta rap media imprint Greedmont Park and clothing label We Are The Process.